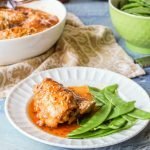 These low carb chili soy chicken thighs are super easy to make in the Instant Pot. Just brown, cook and serve. 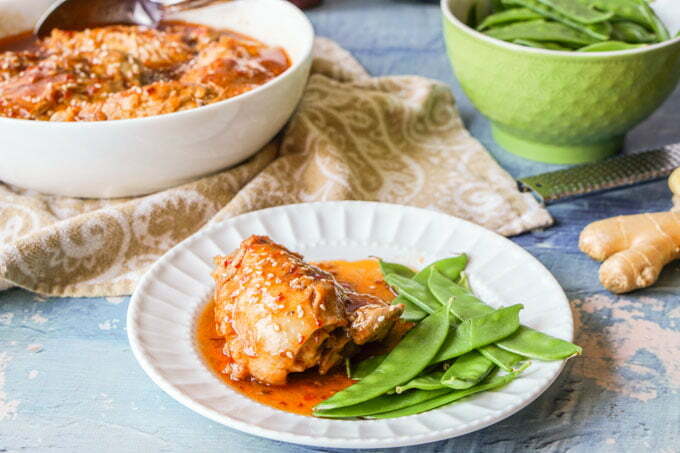 A flavorful low carb dinner that has only 1.0g net carbs per serving! I recently bought chili garlic sauce from an Asian grocery store and have been using it in everything. I’ve seen it in the grocery stores but I never tried it until now. 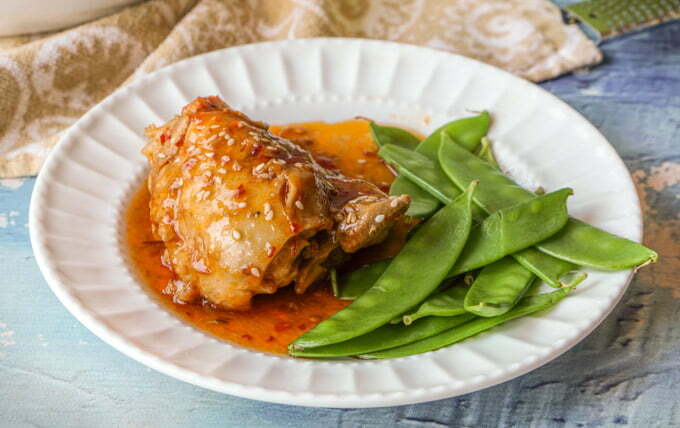 It has so much flavor and makes a great base for dishes like these chili soy chicken thighs. 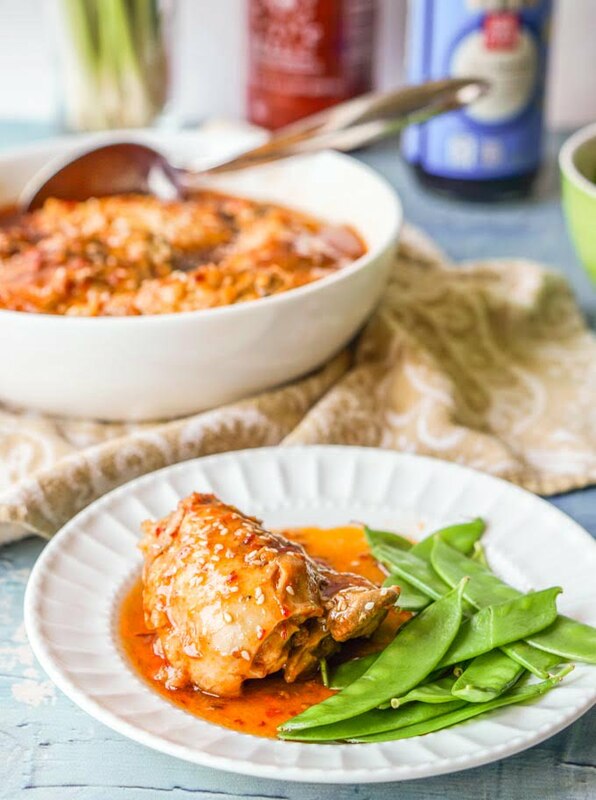 Add in the extra bonus of making this low carb chicken recipe in the Instant Pot and you have a dinner I can whip up in hurry. I intentionally made this low carb but with a few tweaks you can make this into a regular take out worthy dinner if you wish. My first recipe with the chili soy combination was my chili soy salmon recipe. It only uses 4 ingredients and this sauce is awesome with the fatty salmon. We would eat that dish more often if I could easily get good salmon at a good price. So that is why I tried the chicken thighs today. They are very inexpensive and I always have some in the freezer. Press the saute button on the Instant Pot and adjust the temp to high. Add coconut oil to Instant Pot and brown the chicken thighs. In the meantime, mix the soy sauce, chili garlic sauce, Swerve sweetener and fresh ginger together and then pour over the browned chicken. Hit cancel on the Instant Pot and the secure the lid. Move the pressure release valve to seal and press the manual button for 12 minutes. To thicken the sauce, add glucomannon (see below) or cornstarch. (optional). Sprinkle sesame seeds on top if you using. You can make this dish in the slow cooker too. Just brown the thighs before adding them to the slow cooker. A note about the sauce. It will be thin because I haven’t used anything thickeners. However for a low carb thickener, try powdered glucomannan root. Add a half teaspoon to a tablespoon of water and mix well. Then add it to the sauce only and let it heat up until it thickens. If you don’t care about carbs you can use corn starch to thicken. You can also take out the chicken thighs and let the sauce simmer and thicken. If you are interested in the products I used in this recipe like the glucomannan, Swerve sweetener, chili garlic sauce or Instant Pot, you can find them on my my Amazon page here. Hit the sauce button on the Instant Pot and adjust the heat to high. Add the coconut oil and when it's melted place the chicken thighs in and brown both sides (about 3 minutes each side). Meanwhile mix the soy sauce, garlic chili sauce, sweetener and ginger. When chicken thighs are browned, press the cancel button and then pour sauce over them. Secure the lid and push the pressure release valve to the back to seal it. Press the manual button for 12 minutes. When the chicken is done, let the pressure release naturally. To thicken the sauce you can take out the chicken and use glucomannon (low carb) or cornstarch (not low carb). For the glucomannon take 1/2teaspoon and mix it with 1 tablespoon of cold water. Then pour into the pot and mix until the sauce thickens. You can also take out the chicken thighs and hit the sauce button and simmer until the sauce condenses and thickens. Sprinkle sesame seeds over chicken when serving if you are using them. Also you can make this in the slow cooker. Just brown the chicken on the stove first. Make the sauce with everything except the glucomannon and pour over. Cook as you normally would in a slow cooker. Very tasty recipe, but I caution people who don’t like excessive spice. With the chili garlic sauce I have in my pantry, one teaspoon was more than enough to make it spicy! Thanks for sharing your experience. I do like things spicy so it’s good to have another person’s perspective! My husband is a big fan of chicken thighs so I’m always looking for a good recipe to use them in. Thanks. Well it’s very easy to make and you can make it in the slow cooker as well as the instant pot.